Not too much to note about this picture, but I saw the Phillies's twitter account post the following photo and it got me excited for baseball and sunshine and palm trees and baseball and CLEARWOODER. 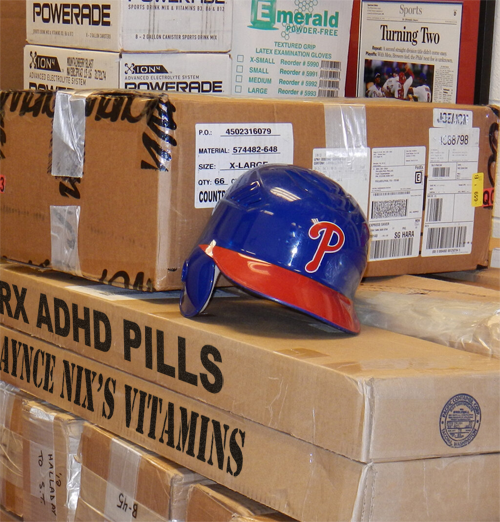 ONE ITEM OF INTEREST: there's a box on the bottom labeled in marker "HALLADAY, To: S.T." OMG what do you guys think it is?! I'll bet it's tools and spare parts needed to maintain the stairs at Brighthouse Field, because those things have to be in dire need of repair by now. Original picture from @Phillies. Photo illustration by ZWR. Countdown to Aces and Kratzes: 6 days! I bet the Powerade boxes are for HLH III as well. They're finally taking your advice, Penguin! Can I steal Countdown to Aces and Kratzes as my official Spring Training countdown tag line? Laynce Nix needs steroids not vitamins.